Guinta’s Response is Unacceptable. Shea-Porter Campaign Calls on Guinta to Drop His Support for Trump Immediately. After waiting all night to see how Trump’s despicable comments would play-out politically, Frank Guinta released a hollow, non-statement that makes it clear that he is still endorsing and voting for Trump even though many other Republicans are denouncing him. Paul Ryan refused to campaign with Trump. Mike Pence, his running mate, says “I do not condone his remarks and cannot defend them,”jumping off a sinking ship. Even Kelly Ayotte is now refusing to vote for him. Conservative Republicans all across the country, from Jason Chaffetz to Scott Garret to, are pulling their support. Rochester, NH— Today, the Washington Post released the content audio recording of Donald Trump using crude and disgusting language to describe how he would approach women. Frank Guinta has refused to stand up to Trump when he attacked a war hero, went after the family of a fallen soldier, and made despicable comments about women. This has gone on long enough. 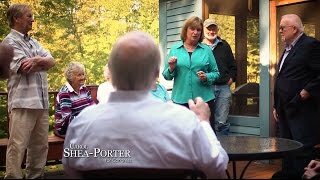 Manchester, NH— Kicking off the general election, the Carol Shea-Porter for Congress campaign released “Vision,” its first TV ad today. The campaign will stay on the air with TV ads until Election Day. The 30-second spot highlights Carol’s commitment to New Hampshire values: family, hard work, responsibility, and fairness. In the ad, Carol talks about her priorities, like passing equal pay for equal work, raising wages for workers, and making sure veterans get the benefits they deserve. Rochester, NH— Congressman Frank Guinta, who claims he supports our troops and veterans even as he votes against increases in funding for them, hit a new low as he remained silent about Donald Trump's latest attack on veterans. Donald Trump, who has never served a day in his life, suggested that veterans returning from the horrors of war and suffering from PTSD “can’t handle it” and “aren’t strong.” Despite the tremendous work many organizations are doing to combat the stigma around PTSD, Donald Trump chose to continue the myth that soldiers and veterans suffer from PTSD because they aren’t strong enough. This is completely offensive, it harms the good work many people are doing to prevent and treat PTSD, and it’s simply wrong. “Frank Guinta is serving as a lapdog for Donald Trump instead of standing up for the people Trump is bullying. Trump's newest attack is again on veterans, and again, Mr. Guinta is silent. Carol Shea-Porter was a military spouse and served on the House Armed Services Committee. She has met many brave men and women who served their country in war and are now being treated for PTSD. They are heroes and do not deserve Trump's insults," said Naomi Andrews, spokeswoman for Carol Shea-Porter. Rochester, N.H. – In New Hampshire, Congressman Frank Guinta talks a good game about his support for veterans, but in Washington, he has a long history of failing our veterans. We owe our veterans the benefits they’ve earned, but Frank Guinta has consistently voted against increasing funding for veterans programs. Just nine months ago, Guinta voted against the Omnibus Appropriations bill that funds the government. The bill increased funding for the VA by $6.4 billion. The legislation, which fortunately was not tanked by Guinta's refusal to support it, increased funding for medical care by $4.7 billion and provided funds to hire 770 VA disability claims processors to tackle the claims backlog. In one fell swoop, Guinta voted to shut down the government and refused to increase funding for critical veterans programs. He even called these important funding increases “inducements to vote for more federal bloat and debt." While serving on the Budget Committee this year, Guinta rejected an attempt [page 258, RC Vote #13] by Congressman Seth Moulton, an Iraq war veteran, to increase funding by $340 million for FY2017 and $1.14 billion for FY2018. These increases would have been paid for raising taxes on the wealthiest and repealing tax breaks for Big Oil and corporations that ship jobs overseas. Today, the Shea-Porter campaign is releasing a comprehensive plan to reform how Congress does business. The plan takes direct aim at our broken campaign finance laws, lobbying disclosure, Congressional disclosure, and Congressional perks. Manchester, NH— Today, former Congresswoman Carol Shea-Porter, Congressional Candidate for New Hampshire’s First District, campaigned with Senator Elizabeth Warren, Democratic Senate Candidate Governor Maggie Hassan, and Democratic Gubernatorial Candidate Colin Van Ostern. Shea-Porter and Warren kicked off the day by speaking to hundreds of volunteers at the field office in Manchester, then joined Hassan and Van Ostern in Durham, where they all spoke to an overflow crowd at the University of New Hampshire. In Manchester, Elizabeth Warren and Carol Shea-Porter spoke to more than 400 volunteers about how important this election is and how essential it is to go out and knock on doors. The two grassroots campaigners excited supporters when they called for eliminating student debt, protecting our environment, passing equal pay for women, and protecting access to reproductive healthcare rights. In Durham, Senator Warren talked about the Republican right wing agenda in Congress and how it hurts regular people. She highlighted Donald Trump’s abysmal history, including the way he ripped off students with his fake university. Frank Guinta is Mr. Trump’s top cheerleader and admirer in New Hampshire, and they are both ethically challenged. The FEC found Mr. Guinta guilty 6-0 of accepting illegal campaign contributions, and there is a new FEC complaint, filed by the former head of the New Hampshire Republican Party, stating that Guinta kept an additional $81,000 of donor contributions for himself. Rochester, NH—Congressman Frank Guinta thought he could get away with voting against the James Zadroga 9/11 Health and Compensation Act. But this was a brutal vote against our heroic firefighters, police, and others, and he will be held accountable in November for rejecting healthcare for our 9/11 heroes. This critical legislation allowed our selfless 9/11 First Responders—our firefighters, police, and others—to receive lifetime healthcare benefits to treat their injuries and illnesses resulting from the terrorist attacks. Mr. Guinta said that he voted against the Omnibus and the money for our heroes because, in his own words, "they are merely inducements to vote for more federal bloat and debt." “Carol Shea-Porter was proud to co-sponsor and help pass the James Zadroga 9/11 Health and Compensation Act of 2010. The Zadroga bill in both 2010 and 2015 was a moment when Democrats and Republicans were able to come together and make sure that our 9/11 heroes were put above politics,” said Shea-Porter spokeswoman Naomi Andrews. "Congressman Guinta put his political and ideological interests before our 9/11 heroes. Firefighters, police, and other First Responders now know they cannot trust Frank Guinta to represent them. They also know that Carol voted for that funding, and that she will continue to honor them and their sacrifices." Rochester— Today, Americans for Responsible Solutions, the organization founded by Congresswoman Gabby Giffords, endorsed Carol Shea-Porter. Americans for Responsible Solutions advocates for common sense solutions to reduce gun violence while protecting responsible gun ownership. "Carol Shea-Porter knows that with freedom comes responsibility, and that we can do more to keep guns out of the wrong hands while protecting the rights of law-abiding gun owners like us. I am proud to support Carol, my former colleague and a leader who is committed to standing up to the Washington gun lobby and to bipartisan change that will help prevent gun tragedies. In Congress, Carol will be a tireless champion for the vocal majority of Granite Staters who are calling on their elected leaders to do more to reduce gun violence and make our communities safer,” said Congresswoman Gabrielle Giffords. Rochester, NH—Democratic candidate Carol Shea-Porter issued the following statement on Frank Guinta’s extremely narrow primary win. “Frank Guinta's primary opponent was right when he said Guinta is unfit for office. New Hampshire deserves better. I look forward to holding Congressman Guinta accountable for his constant deception of New Hampshire voters. His brazen lies about illegal campaign contributions, his record, and his unfounded personal attacks have no place in our state. He has repeatedly lied to the people of New Hampshire, and when caught red-handed, he refused to admit or apologize, even when Republican leaders and New Hampshire newspapers called on him to do so. Congressman Guinta has made a mockery of the values we cherish in New Hampshire: honesty, integrity, transparency, and independence.